​Kent Ferguson, currently a volunteer at St. Joseph Mission School, was the Founder and Headmaster of the Santa Barbara Middle School in California, the School Down Under in New Zealand, and the New Alternative School for children placed in Group Homes in Southern California. He was Chairman of the Humanities Department at Laguna Blanca College Preparatory School in California and the Director of the International Residency Program at Howard School in the same State. He has served as a friend, consultant, and board member for Montessori Schools, Waldorf Schools, Maori and Tibetan schools. 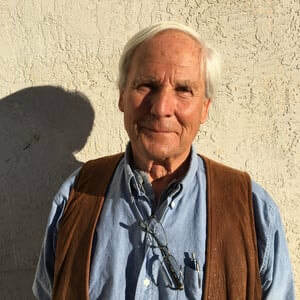 In 2000 he was named a “local hero” by the Mayor and City Council of Santa Barbara for his (then) 3 decades of educational leadership and teaching in Santa Barbara. He was the Educational Editor for Sceptic Magazine, Family Times Newspaper, and has participated in almost a dozen educational publishings. He currently is retired, writing, and living is his straw bale home in the Zuni Mountains. He believes that Mother Nature is among the best teachers and that the campus can be and should be most anywhere within 3 hours of San Fidel!